Many countries will likely face the need to increase tax revenues, as part of fiscal consolidation, during the next few years. But how is this best done? 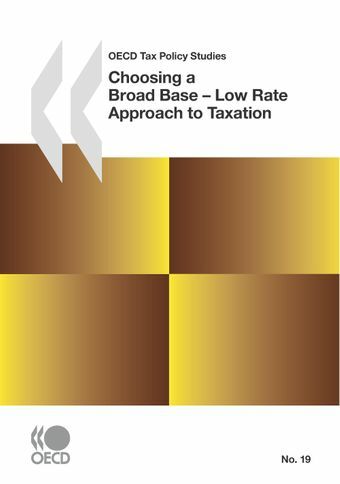 And what are the considerations when choosing between raising tax rates and broadening the tax base by scaling back or abolishing targeted tax provisions (such as allowances, exemptions and preferential rates)? This report aims to answer such questions by taking a close look at the economic and political factors that influence governments’ tax decisions. Although many countries have broadened their tax bases over the past 30 years, targeted tax provisions, notably tax expenditures, continue to be significant. Like public expenditure, targeted tax reliefs mean that (other) tax rates need to be higher in order to finance these reliefs. This report therefore discusses whether such tax provisions continue to be worthwhile. It includes an annex covering country-specific revenue forgone estimates of tax expenditures for selected OECD countries. This report also identifies political factors, including the lobbying of influential interest groups, as the main obstacles to base-broadening reforms, and it considers how reforms can be best packaged and presented to overcome such obstacles. Where is there Scope for Base-broadening? Download a summary of the report. Few people like to pay tax and even fewer like to see their existing tax burdens rise further. Many governments have thus found that the most propitious time for tax reform is when the state public finances allows an overall reduction in taxes or, failing this, a revenue-neutral reform that allows some compensating cuts for politically sensitive groups of taxpayers. At present, many countries are not in such a fortunate position. The need to undertake fiscal consolidation strategies over the medium term leaves little room for manoeuvre to finance any tax reductions. In many cases, countries’ assessment of the appropriate balance between cutting public expenditure and raising taxes means that tax revenues will need to be increased. Read more on Tax Policy Reform and Fiscal Consolidation.